Marysville’s Logan Painter (right) fights off a potential takedown in this file photo. Painter won his match by a pinfall on Thursday as the Monarchs defeated Hilliard Davidson. 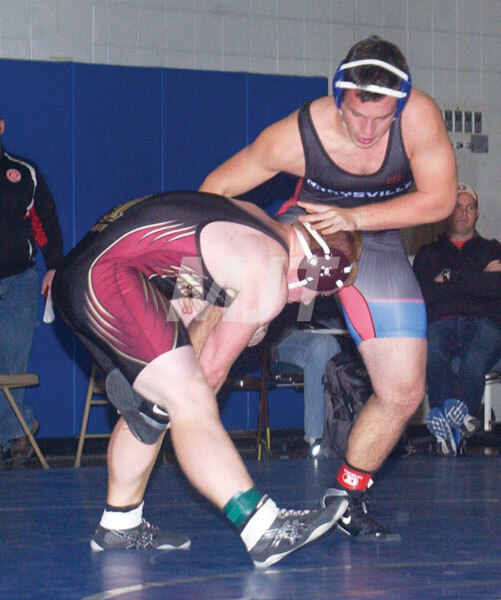 Marysville’s varsity and JV wrestlers won dual matches against Hilliard Davidson on Thursday. The varsity rolled to a 56-15 verdict, while the jayvees took a 27-15 decision. -285: Joseph Palmer (M) won by forfeit. -195: Joshua Raimey (HD), pinned C.J. Grose (M), :18. “We knew going in that Davidson was down compared to past years,” said MHS head coach Shawn Andrews. “Our focus was to score as many points as possible and to rack up bonus points for the team. “We were able to score bonus in eight of the 10 matches we won on the varsity side and three of the six JV matches we won,” he said. The Monarchs will travel to Dublin Jerome on Saturday for the All-North Tournament. “We will see quite a few Central District teams at Jerome,” said Andrews. Marysville will conclude the regular season on Thursday with a Senior Night match at home against Central Crossing.